All classes are primarily taught in Mandarin – 90 percent Mandarin to 10 percent English. 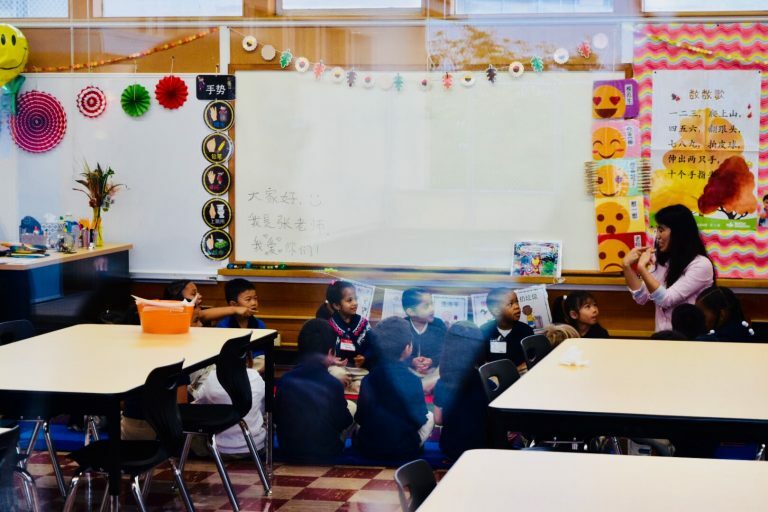 By second grade, the division will become 70 percent Mandarin to 30 percent English, and as the students progress in grade levels, the ratio will become 50/50, Mandarin/English. The students learn spoken Mandarin and to read and write simplified Chinese characters. The students also have daily reading/phonics instruction in English. The students also participate in a mindfulness class, facilitated by The Mindful Life Project, which helps students gain self-awareness, confidence, self-regulation and resilience – lifelong skills. In addition, Skyhawks Sports Academy coaches structured play and sports activities during morning and lunch recess. School hours are 8:30 am to 2:20 pm everyday, except Wednesdays. Dismissal is at 1:45 pm every Wednesday. Mandarin is the most spoken language in the world, with over 1.3 billion native and second language speakers, and as validated by Ioannis Ikonomou, a translator who speaks 32 languages, Mandarin is difficult to learn. However, despite its level of difficulty, students learn Mandarin effortlessly when they are taught in an immersion setting with teachers who are native speakers. Students learn Mandarin fluidly by use of visual aides, singing songs, learning phrases for everyday greetings and routines, hands-on activities, and repetition generally. The students also use an online Mandarin program, Better Immersion, to supplement their instruction.